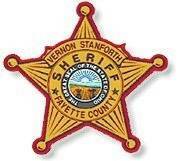 A male suspect was shot and killed Wednesday afternoon by a Fayette County Sheriff’s Office deputy on Rockwell Road after he allegedly displayed a firearm, according to Sheriff Vernon Stanforth. The man, who had been identified as a suspect in a crime, was approached by a sheriff’s detective on Rockwell Road near Mount Sterling. Stanforth said the suspect displayed a firearm and, following orders to drop his weapon, the man was shot and died at the scene. No deputies were injured during the incident, Stanforth said. The suspect’s name was not identified as of press time Wednesday night. The Ohio Bureau of Investigation was requested to the scene to initiate the investigation. The Fayette County Coroner’s Office was also called to the scene and pronounced the man deceased. The Madison County Sheriff’s Office provided assistance at the scene. No other information was available as of press time. Stay with the Record-Herald website, www.recordherald.com, and the print edition for the latest on this developing story.